Illinois kids hoping to attend college might start honing their pizza-delivery skills now. They're going to need all the tips they can earn. While 97 percent of Illinois parents hope their children attend higher education, one-third of those households are not saving for college, but why? A survey by Bright Start College Savings reveals that parents say a lack of available funds and a lack of knowledge about savings are the biggest barriers. Financial advisors, though, say parents can overcome these barriers more easily than they may think. 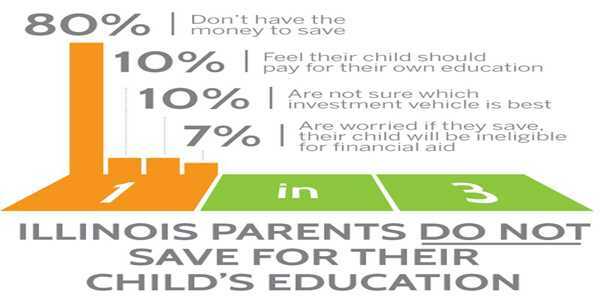 The majority of Illinois families (80 percent) who aren't yet saving say they simply don't have the money to put aside for future education expenses. College savings expert Andrea Feirstein, managing director of New York-based AKF Consulting Group, urges parents to set aside these reservations and start planning to save today. "Time is your biggest asset when saving for the long term," she says. "With many financial planners warning against burdensome student loans -- that can take years to pay off -- finding alternative ways to pay for college becomes crucial," says Bridget Byron, Director of College Savings Programs at the Illinois Treasurer's Office. 1. Start with small changes. Bring lunch from home, and save as much as $50 a week. Scale back on or eliminate luxuries like magazine subscriptions, monthly manicures and premium cable channels. 2. Open a tax-advantaged 529 college savings plan, and ask family and friends to contribute to your child's account in lieu of birthday and holiday gifts. 3. Create a family matching plan. Kids put part of their allowance, earnings or gifts into a savings account, and parents match dollar for dollar (or more). This will help them learn future saving habits, too. 4. Set up a direct deposit to have a small portion of your paycheck go directly into a college savings account. 5. Take account of all spending. Make a spreadsheet that buckets every single dollar spent. Review it monthly to see where you can divert money into a savings account.